The Soraa Snap System is the first LED lamp/accessory solution that is optimized to work as an integrated system. 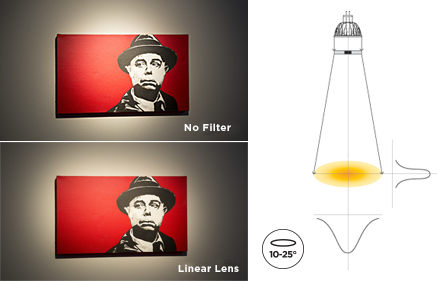 Based on high brightness single source GaN on GaN™ LED technology, it completely redefines accessory application. Multiple distributions with single lamp specification can now be achieved with an ease that was never, and beam shapes can now be applied as it was never before possible to fine tune lighting installations for unique conditions and requirements. The Snap System has several beam shaping attachments, including beam spreaders, linear lenses, and “flat-tops” that provide rectangular beam distribution patterns to perfectly illuminate furniture, art, and other rectangular objects. The CCT Shifter filters can provide color temperatures that are rare or impossible to find, like a warm, glowing natural 2200K CCT, providing excellent flexibility and freedom to adapt many color temperatures to any installation while specifying only one lamp. The Soraa lamps’ clean light and excellent color rendering are a perfect match for CCT shifting. Also, the relatively low temperature of the Soraa MR16 Snap System lamps mean that new accessory materials, such as advanced polymer films, can be used for beam and color control in ways never before possible. More information and availability at the Soraa website. Mr. Clive Slattery explains how the clever SORAA snap-on lenses and filters gives you freedom to create the light that you need using the SORAA LED light sources. Simple yet brilliant!